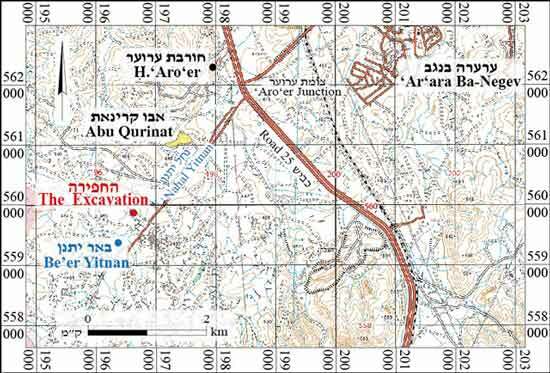 In April–May 2015, a trial excavation was conducted slightly west of Nahal Yitnan, near the Bedouin settlement Abu Qurinat (Permit No. A-7376; map ref. 196533/559877; Fig. 1), prior to the development of a new residential neighborhood in the community. The excavation, undertaken on behalf of the Israel Antiquities Authority and financed by CPM Construction Management Company Ltd., was directed by D. Yegorov (photography) with the assistance of Y. Al-ʽAmor (administration), S. Gal (GPS) and M. Kunin, A. Hajian and M. Kahan (surveying and drafting). 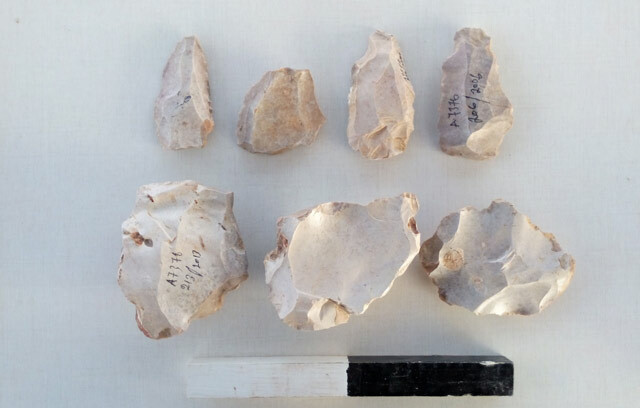 The excavation was conducted on a hill subsequent to a survey that documented flaked flint items attributed in part to the Mousterian culture (Middle Palaeolithic period; License No. S-552/2015). Three areas (A–C; a total of 176 sq m; Fig. 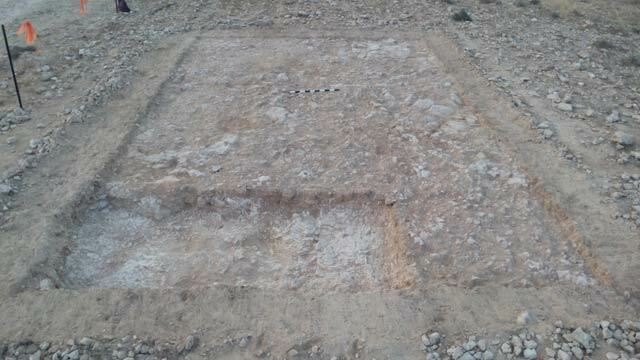 2) were opened and the excavation squares were arranged in a 2 × 2 m grid. The excavation yielded artifacts from the Middle Paleolithic period and probably the Early Bronze Age. 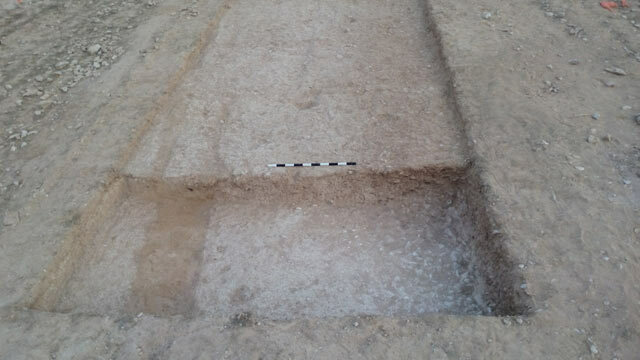 Remains of a rural settlement dating ptobably to the Early Bronze Age were uncovered in an excavation that took place in 2007 (Talis 2010), c. 1.5 km northeast of the current excavation area. 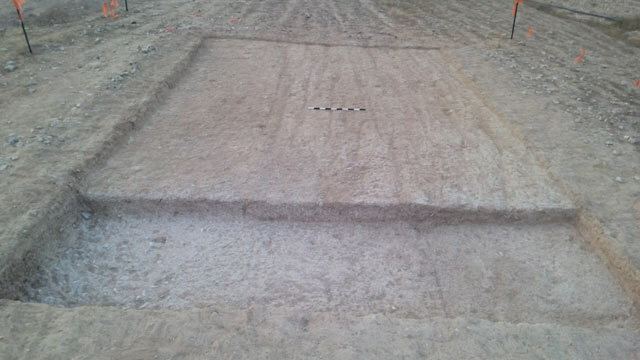 No ancient remains were recorded by a survey carried out in 2011, northeast of the excavation area, other than a well that was located east of the survey limits (Paran and Sontag 2012). 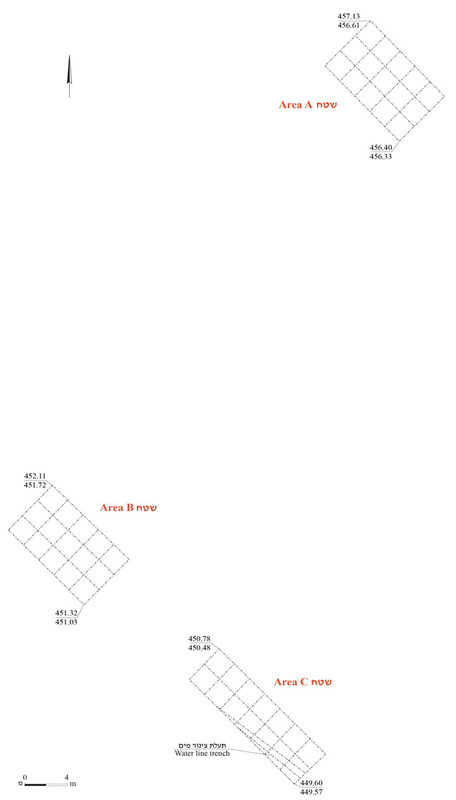 Area A (60 sq m; Fig. 3), on the hilltop, yielded an extremely dense scattering of flaked flint items on the surface. The area was excavated to a depth of just 0.3 m until reaching bedrock, and flint items were found; the number of flints diminished as the excavation deepened. 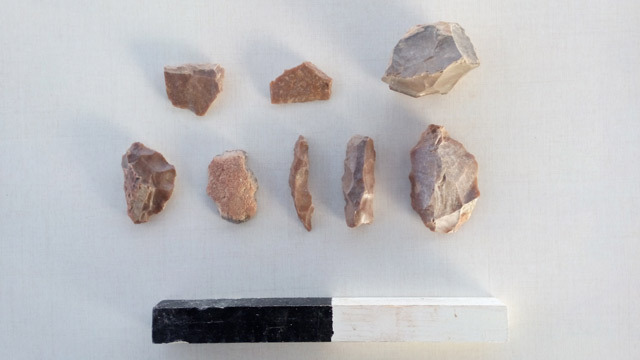 The artifacts collected from the excavation and the surface included flake and blade cores, a large quantity of debitage, a fragment of a proper tool (chisel) and several ad hoc tools (Fig. 4). Just a single fragment of an ancient non-diagnostic pottery vessel was found. Most of the lithic assemblage dated probably to the Early Bronze Age. Areas B and C (116 sq m; Figs. 5, 6), both on the southern slope of the hill next to the streambed, yielded a thin layer of tamped loess (thickness c. 0.15 m), mixed with numerous flaked flint items including cores, flakes and points knapped in Levallois technique, attributed to the Middle Palaeolithic Mousterian culture (Figs. 7, 8). 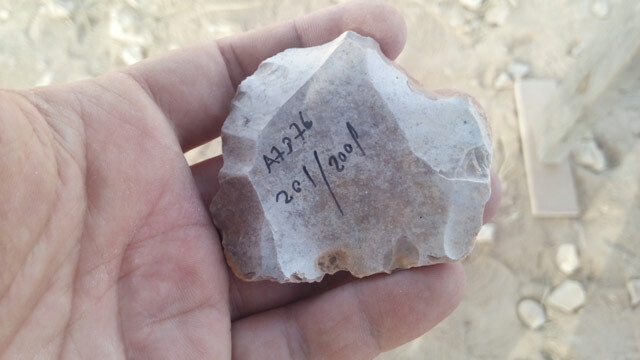 The excavation results indicate that the site was inhabited during the Middle Paleolithic and probably the Early Bronze Age, probably because of the easily accessible raw material used in the production of flint tools. Paran N.S. and Sontag F. 2012. Tel ʽAroʽer (South). HA-ESI 124. Talis S. 2010. Nahal Yitnan, Abu Qarinat. HA-ESI 122. 3. Area A, looking southeast. 4. Flaked flint items from Area A. 5. Area B, looking southeast. 6. Area C, looking northwest. 7. Flaked flint items from Areas B and C.
8. Levallois core from Area B.